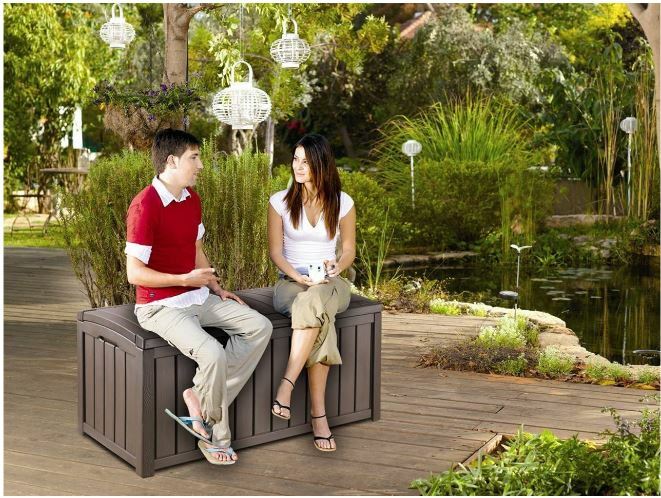 Organising outdoor paraphernalia has become quite the rage recently, resin storage boxes for the garden deliver an uncluttered space in minutes creating a pleasant setting rather than stuff scattered around all over the place generating chaos in the environment. 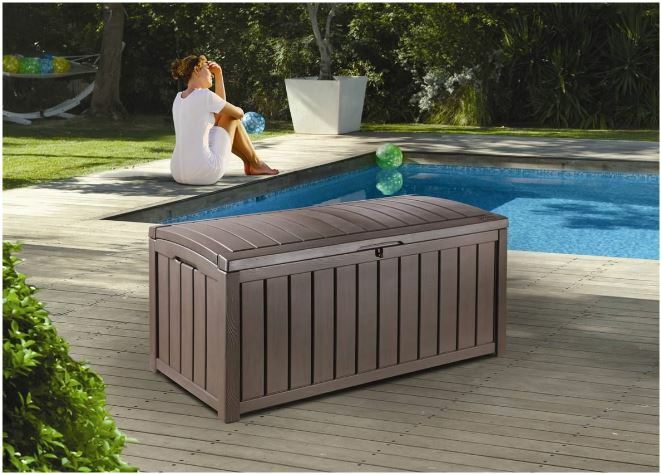 Keter manufacture low maintenance outdoor storage solutions, their ever increasing deck box range has become cherished by the mainstream for those seeking to construct a more organised lifestyle whilst ever evolving technical advancements through craftsmanship are presently producing admirable styles exhibiting eye appeal intended to complement any garden scenery. 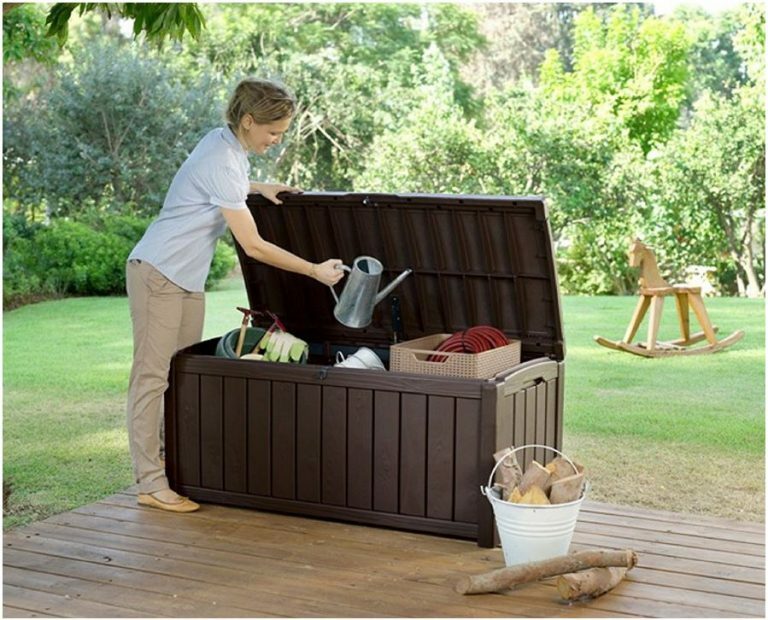 This post regards inspecting Keter’s Glenwood deck box, a storage facility displaying an eye-catching composition, large enough to hide away a whole host of outdoor gear whilst trumpeting out weather-resistance values and a stay-dry interior. The Glenwood provides the perfect storage accessory situated poolside holding swimming gear or pool chemicals, sat on a patio accommodating furniture seating cushions and accessories, organising grilling utensils stood on a BBQ deck, a popular service store for gardening equipment, tools and lawn supplies or a fab haven occupying kids toys generating swift garden tidy-ups at a moments notice. 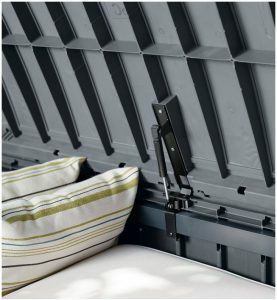 Alternatively we have friends who have similar storage boxes situated in their garage storing the likes of fishing gear, climbing equipment, sporting accessories or a great works tool storage facility for those working from home or clearing the car for weekend use. Deck boxes have no distinctive purpose, new ideas are being created daily for organising space, ideas simply regard one’s situation. Our deck box decision geared round finding an alternative solution for storing outdoor seating cushions rather than the hassles created indoors finding room where to store these bulky items. 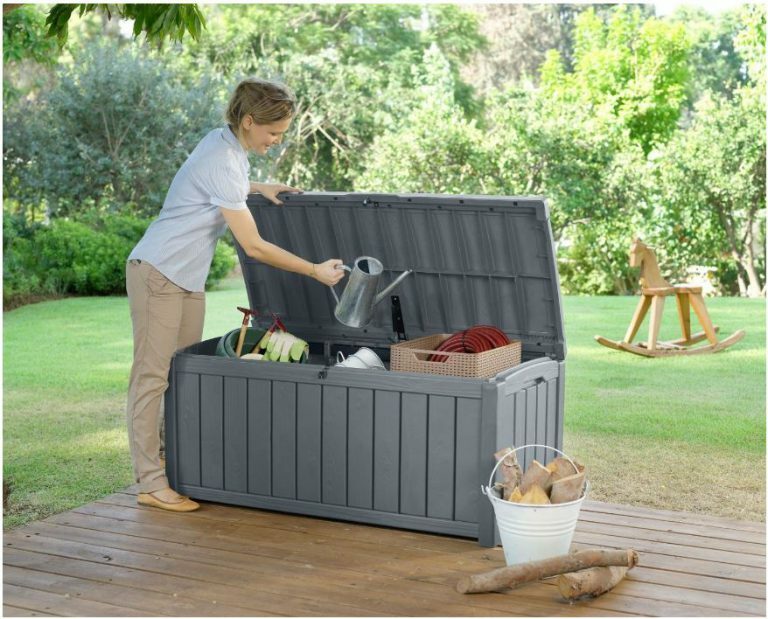 We have it sat on the patio serving this storage purpose plus harbouring necessities and clearing the deck during the summer months, making the choice of a flat lid to provide table-top services and a sturdy make-up to support additional seating if required. All deck box styles differentiate, deciding relates to choosing the style, colour, sturdiness and features suited to your circumstances. Escaping the decaying problems wood is prone to when exposed to the weather elements the Glenwood make-up regards a polypropylene fabrication encasing the entire unit in substantial weather defence material resistant to rotting and decaying issues. Two shades complete the Glenwood range. Anthracite grey or oak brown tints blend in to the polypropylene resin mix whilst the molding technique creates an admirable wood panelled effect facade containing four corner posts representing a wood grained textured impression running through. 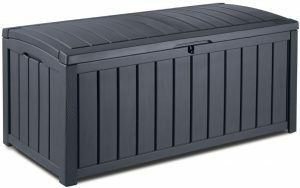 The Glenwood is designed to accommodate 101 Gallon / 390 Litres storage capacity able to occupy an internal storage weight up to 50 kg / 110 lbs providing a useful organised solution to shelter a diverse range of outdoor stuff. Incorporated into the polypropylene resin mixture are UV inhibitors equipping the box with enhanced surface protection, preventing discolouration and splitting when threatened through sun rays, an inherent problem yesterday’s plastic deck boxes were susceptible to. The real advantage however generating attraction towards the Glenwood design relates to the effortless duty to maintain the unblemished appearance, a soft brush or cloth plunged in warm water containing light detergent is all that’s required for the undemanding service of a swift clean. Many prefer a light hose down however it’s good practice to empty the box for this duty in case the water pressure seeps inside. No deck box can be described as fully waterproof because if you fully immersed them they will succumb to leakage through their interlocking design however this does provide storage preservation advantages regarding a ventilated interior whilst they are distinctively designed to maintain a dry internal space when exposed to rainfall, safeguarding items held within. With respect to accessibility, opening the lid is delivered by two hinges incorporated either side whist a piston integrated at the central position conveys the automatic opening mechanism, aiding the lids weight. Start to open the lid and the pressured gas within the piston takes over. Gas Shock pistons create a child friendly feature ensuring a slower lid closure by supporting the weight making this box suitable for toy storage, one of it’s popular yet advantageous features. Internally running the full length at the top of the front and back facade, the Glenwood is fitted with metal reinforcements combining the storage unit with comfortable seating ability like the images show, producing bench seating for two adults with a weight limit of 240 kg / 530 lbs. 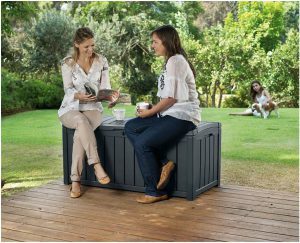 We find the provision of seating ability offers a huge bonus when guests exceed chair space on our patio, the box many times compensates for an additional resting place especially at BBQ times. The Glenwood lid however is slightly curved, usage for table-top services is rather limited due to the top not being perfectly level however this depends on the service required and eye appeal that floats your boat whilst suiting your intended location. The lid overlaps the box body’s upper ridges upon closure preventing water leaking internally, safeguarding storage whilst the slightly curved lid design creates an efficient rainwater drainage system. Inside, the Glenwood can’t be described as having admirable eye appeal due to the plethora of ridges incorporated into the molding design however they are hidden from view yet do play the imperative role in providing rigidity to the overall structure. Two clasps designed for a padlock are fastened to the lid and box frontage during installation adjoining together upon closing the unit enables locking the box for security purposes whilst molded handles inserted either end of the deck box aid movement into the desired location. The Glenwood incorporates 390 Litres / 101 Gallon internal storage capacity able to support a weight limit of 50 kg / 110 lbs with a seating capacity weight limit of 240 kg / 530 lbs. 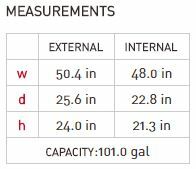 External and internal Glenwood dimensions are presented below to check with storage requirements and location. Building the Glenwood is a very straightforward operation. Within an hour from unpacking the box, it should be built, filled and serving to its full potential positioned in the desired location. It’s important to note: A thorough examination of the instructions is pivotal to determine correct installation making sure the specified parts are fitted the right way round according to the illustrations represented in the instructions. A few assemblers have resulted in their Glenwood deck box lid not laying flush to the body, like one guy says it’s imperative to fit the correct parts the proper way round in order to accomplish a perfectly working box. 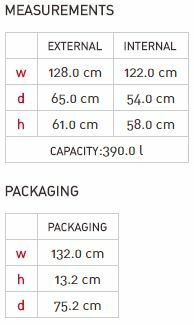 All the parts are labelled by numbers and these should correspond to the parts labelled in the instructions, then make sure the parts are aligned the precise way as shown in the instructions. If you are unfortunate to receive damaged parts, ask for a replacement and return the deck box. Resin constructions seldom work as described when fit with faulty parts. There’s no excuse on the suppliers part leading to a few purchasers not receiving the instructions however the assembly instructions can be downloaded below rather than trying to figure out the construction process. Constructing the box is a pretty basic operation as the main body parts interlock with each other and click into place. The base, metal reinforcements, security clasp and piston are the only parts fitted with screws. Assembly procedure requires working through the steps in order implementing what’s show. 15 steps conclude the build. 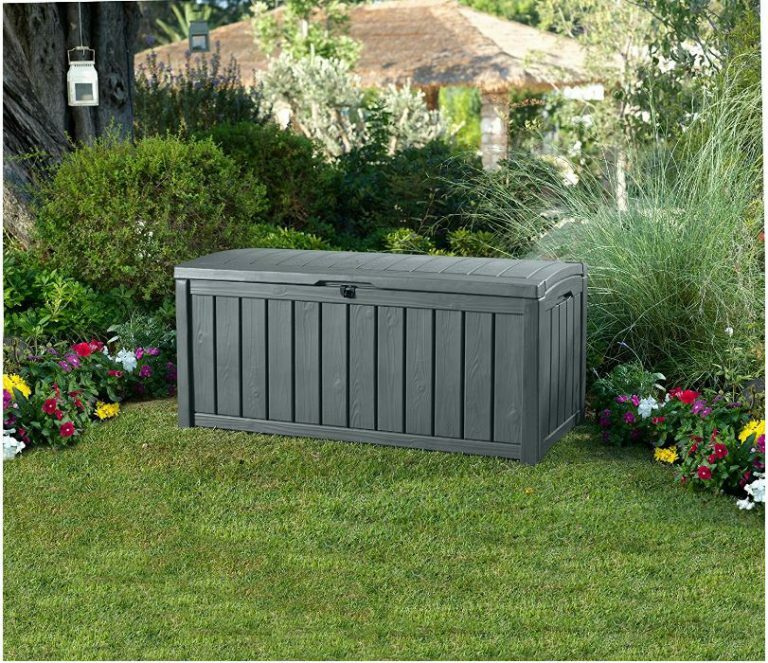 The Glenwood portrays a stylish design destined to contribute an admirable addition to any home garden settings, either displayed in anthracite grey or oak brown. Delivering excellent service around a barbecue deck, patio area, located in tight garden spaces, on a balcony or situated poolside is what the Glenwood is specifically designed for. Encased in a weather-resistant manufacture withstanding deterioration in terms of rot, rust and decay whilst providing protection against denting, peeling, colour fade and cracking when exposed to sunshine. Polypropylene resin trumpets out these weather defence advantages whilst formulated out of an easy to clean surface and a 100% recyclable environmentally friendly material. Child friendly pistons provide the automatic opening mechanism whilst supporting lid weight during closure. A dry ventilated internal environment preserves storage, ability to double up for sturdy adult seating with a competitive price plus two year limited warranty provides the excellent value. 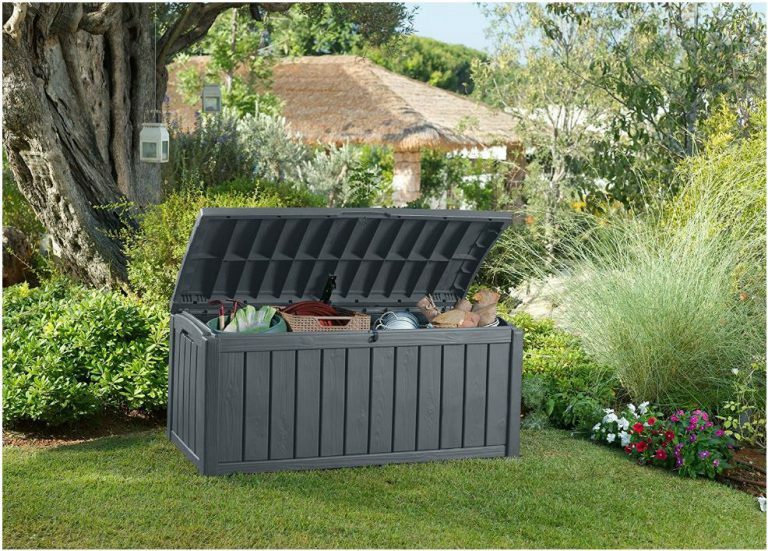 Thanks for reading the Glenwood Garden Storage Box review. Please ask any related questions in the comment section below. Always happy to help. What great through information you provided here! By the time I got done reading I needed to know how much! Being an out-doorsy person with animals and dogs I can think of so many uses for these boxes. My dog agility yard is scattered with small bits and pieces that would certainly look better if they were out of sight. I love how these boxes double as an extra seat, and I LOVE that although they should last a LONG time, they are recycle-able and come in so many different colors! That is cool. I will have to save up my pennies. I would like to know if any recycled materials go into the making of these well designed storage boxes? Thanks for reading the Keter Glenwood deck box review. 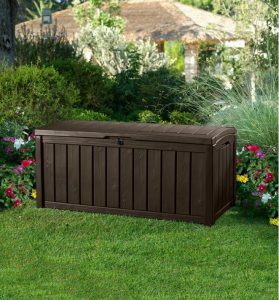 Yeah, we used to have stuff scattered around the garden but once we purchased a garden storage box like this, tidying up became so easy, now we look out onto a clean environment. It only takes 2 minutes to open the box and clear the space whether indoors or out, the reason many opt to purchase additional storage boxes for different uses, their storage purposes are quite diverse. 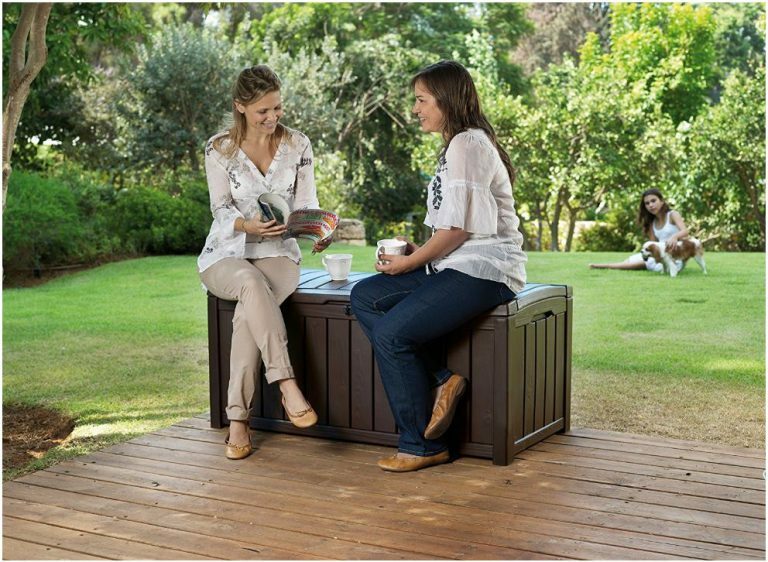 Personally we decided to choose a deck box with sturdy seating ability and a flat lid to provide table-top services. It’s great when visitors arrive or a BBQ times as the box can serve these additional requirements when seating becomes sparse or extra table top room is required. The polypropylene resin is weather-resistant withstanding rust, rot and decay whilst also providing defence against colour fade and cracking when exposed to sun rays and as you mention they are all made out of recyclable polypropylene resin which is as environmental friendly as possible. I have tried to find the answer whether they are manufactured from recycled plastics but to no avail however as long as the finished product can be used again suits me.